Mangoes stand among the most popular fruits globally and are titled as king of fruits. 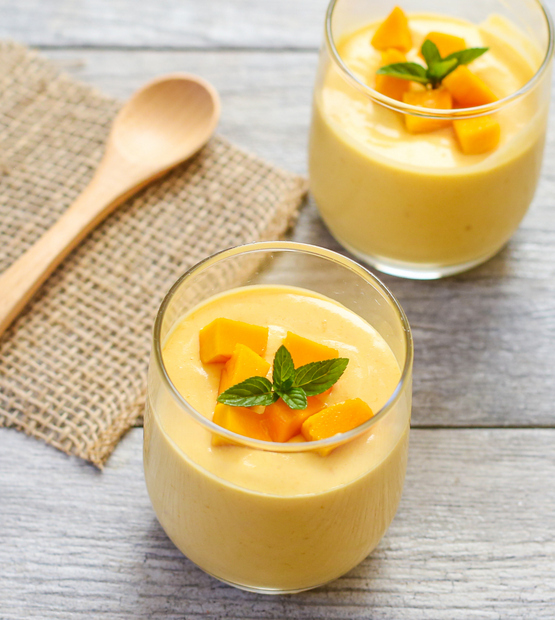 This is an easy recipe to make mango mousse without eggs which is lovely in texture and delicious in taste. This egg-less mousse may be made using very few ingredients and it may be served as an after dinner dessert as well. Note: You may also use canned mango pulp. Put a small saucepan on medium heat with fresh cream in it, bring it to a boil and immediately turn off the heat. Stir in chopped white chocolate and mix to melt chocolate until well incorporated. Add pureed mangoes into cream and chocolate mixture and stir gently. Beat the heavy whipping cream and powdered sugar in a bowl with an electric beater for 2 to 3 minutes or until peaks form. Fold whipped cream into mango mixture, mix very gently to fold cream into mango mixture. Plate up by pouring the beautiful mousse into serving glasses. Garnish with chopped mangoes. Refrigerate to chill for an hour before serving.